Married life is a wonderful, beautiful, complicated mess. It becomes even more complicated when a couple tries to introduce kids into the equation. Sadly though, not all couples are able to able to conceive a child on their own. Not every marriage ends happily and Katie Page had to learn this the hard way. Katie was in her early thirties when the divorce happened. It wasn’t a surprise though. She and her ex-husband had been having troubles almost as soon as they began to attempt to start a family together in earnest. Page and her husband were having issues getting pregnant, so they did what any sensible couple would, they went to the doctor. After many tests, they found that the issues lay in infertility, but that was only part of the issue. She and her husband were just incompatible and they wanted different things. Page was missing something and it wasn’t her husband, it was something else entirely. Page still had dreams of being a mom; it was on her bucket list. Her divorce now complete, she knew that the traditional way was lost to her, but she had other options. In 2016 she became a foster mom, but she still knew she wanted to adopt as well. Being a single mom isn’t easy, this was something she knew before even going in. So before she went to adopt, Page wanted to get a feel for child care. She cared for four foster children in her early 30s, all while working full time. Things were going well for a time and then, she met Grayson. Little Grayson had been abandoned at the hospital and from the minute that Page laid eyes on him, she knew that their fate was sealed. “The minute I saw him in the hospital, I fell in love,” Page told Good Morning America. “He’s so calm and sweet…” At the same time though, she admits that he’s been one of the biggest challenges of all the kids. Raising Grayson proved to be one heck of a challenge. Part of this was due to the fact that he had apparently been exposed to methamphetamines in the womb. The rest of the challenge lay in the fact that he was a baby boy, something that the single mom had only dealt with sporadically before then. On May 25, 2017, Page officially adopted two-year-old Grayson. A month later, she received a call from the hospital. They had called to inform her about a newborn girl named Hannah who had just come in. Like Grayson, she had been abandoned by her mother right after birth and needed a good home. Even though things with Grayson had been tough, Page was not about to dismiss a newborn baby girl out of hand. She went down to the hospital and arranged to meet the child. As soon as she saw the girl, she knew that she had to give her a forever home; just like she had with Grayson. She had no idea how similar the two children truly were. Page brought Hannah home and began the challenging process of balancing the care of a newborn and a two-year-old. As she was laying Hannah down on the changing table, she noticed the name of the girl’s biological mother on the infant’s hospital bracelet. The name seemed awfully familiar. At the time, Page couldn’t recall where she’d seen the name before but decided that once things settled down a bit, she’d pursue the subject with the folks at the hospital. A few days later, Katie Page received the surprise of her life. 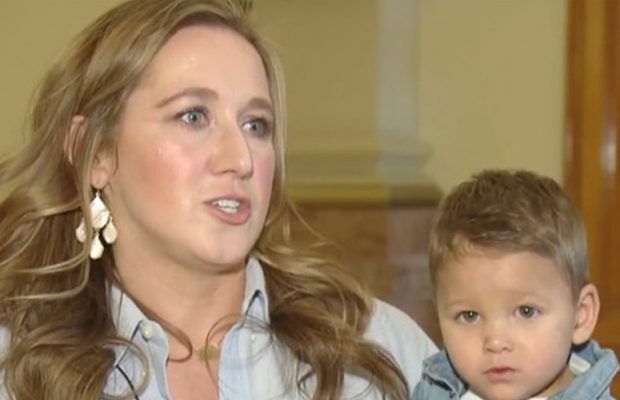 The baby girl she was about to adopt was actually related to her newly adopted son. Page had recalled that the name on Hannah’s medical bracelet was the same as the one on Grayson’s had been. The woman had a unique name, so the fact that the name was the same on both bracelets made the situation pretty obvious. Page contact little Hannah’s caseworkers and the story they told her turned out to be really similar to Grayson’s story. The problem was, it was still unclear whether or not Grayson and Hannah were brother and sister. Their mother had lied about her last name and date of birth on the day she left Grayson at the hospital, so it wasn’t like they could get any direct proof. They did share certain links besides her name. The fact that both Hannah and Grayson had been exposed to methamphetamines in the womb was a pretty telling coincidence. It was likely that the mother of the two children had a drug problem and was unable to provide for the children as they came along. Still, it wasn’t as if they could track her down. That was not for lack of trying on Page’s part, however. Ashley Chapa, her roommate, was present when Page first attempted to unravel the mommy mystery. Ashley marveled at how surreal the whole situation was. Page wanted to be sure, so she pulled out all of Grayson’s paperwork and began digging. Page had always kept things pretty organized, especially when it came to her kids’ paperwork. “Katie got her binder out from her paperwork with Grayson and we realized, same first name – everything.” Nevertheless, there was no information on the mother to be found. In the end, though, it was more than enough for Page. As soon as she figured out that she had two siblings, she told the hospital that she would absolutely adopt her. “Once I took in Grayson and I accepted being his mom, I accepted his family.” The story went viral soon after the adoption. On Dec. 28, 2018, Page officially adopted Hannah as her own. She even had an official DNA test done prior to that in order to confirm they were biological siblings. They would have been brother and sister either way, of course, but this added element only served to make their story that much more incredible.